It has been in the 90s pretty much every day since we got to Missoula, Montana, our new home. If it’s this hot here … well. Dogs everywhere are suffering. 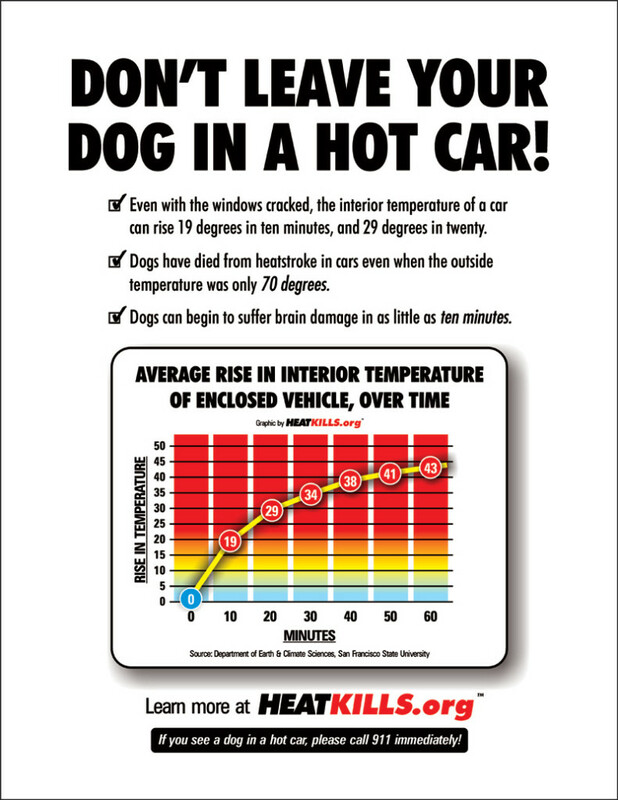 I know I don’t have to remind readers not to leave a dog in the car for even a minute in this heat. No way, no how, it is too hot for that. But what about walking them? Hot pavement can burn pads and paws. Sand, dry stiff grass, seeds, etc. can poke and scratch. Hazards are everywhere. When the temperatures are in the upper-80s and above, the sidewalk can get very hot. You might not notice it through your shoe soles, but think carefully about where you ask your dog to walk. This is a huge concern for service dogs, since they are more likely to be out an about in any weather than pets. What to do? First, avoid blacktop. Let the dog walk on grass or dirt wherever possible. Gravel gets hot, too. Light-colored sidewalks are better than asphalt, but in this heat, they will be hot too. If it feels hot to your feet or the palm of you hand, it’s uncomfortable for the dog. Let the dog stay home if possible. Or walk early in the day, before the sidewalk gets hot. A recent discussion on a service dog email list settled on two possible solutions for dogs who must go out on hot days: booties and paw-protecting cream. The best booties, the consensus is, are these: Ruff-Wear Grip Trex. Guiding Eyes for the Blind recommends them, too. These are more suitable than regular dog boots because they have a breathable mesh top. Even so, booties are not an ideal solution. They can be hard to put on and take off, which is an issue for many service dog partners. In addition, and possibly more critical in this heat, is that dogs need to sweat through their paw pads to cool off. These booties let some sweat evaporate, because they have that mesh top, but I still worry that the rubber sole will interfere with the dog’s ability to cool off. If you use them for short outdoor walks and remove them as soon as you get indoors, they are probably a great solution. If your dog tolerates them … and that is the final objection: Most dogs hate booties. Some people begin conditioning very young puppies to wear socks or booties, and they might have some success. Some dogs are just OK with stuff on their feet. But most dogs? Not happening. So option two, which is also an option for winter, might be a better choice: Musher’s Secret. I just got some. It’s easy to apply, and seemed to absorb very quickly. Cali didn’t object at all, and she really isn’t crazy about having her feet handled. One review I saw online said Musher’s Secret helps dry, cracked noses heal, too. I have noticed that Cali’s nose and feet are dry and rough; I hope this helps get them back to a healthier state. Many online reviewers love Musher’s Secret; a small minority hate it. Stay tuned for a report on the state of Cali’s nose and toes. Other ways we’ve dealt with the heat? I got out the wading pool for Cali, Mack, and Alberta the other day … and they all ignore the cool water and wondered why I had dunked their favorite toys. Silly girls. Yesterday, Cali finally got to explore Jacob’s Island, a dog park in the middle of the Clark Fork River in downtown Missoula! How great is that? A sandy-legged, smiling Cali was led reluctantly from the park after a spirited splash in the river with a young Lab mix. We’ll need to do that more often! Fortunately, it hasn’t been too terribly hot here in southwest VA. do you think most dogs would show some sign of discomfort and not wanting to walk if the sidewalk was hot, or would they just ignore it and keep walking because they enjoy walking so much? I think that depends on the dog! I think that Cali would keep walking, and when we got home, she’d start licking her paws. Other dogs might stop, pull toward grass or shade, lift a paw … someone on the assistance dog list mentioned a dog (a thin type, a sighthound maybe) lining herself up with the shadow of a telephone pole and lying down!